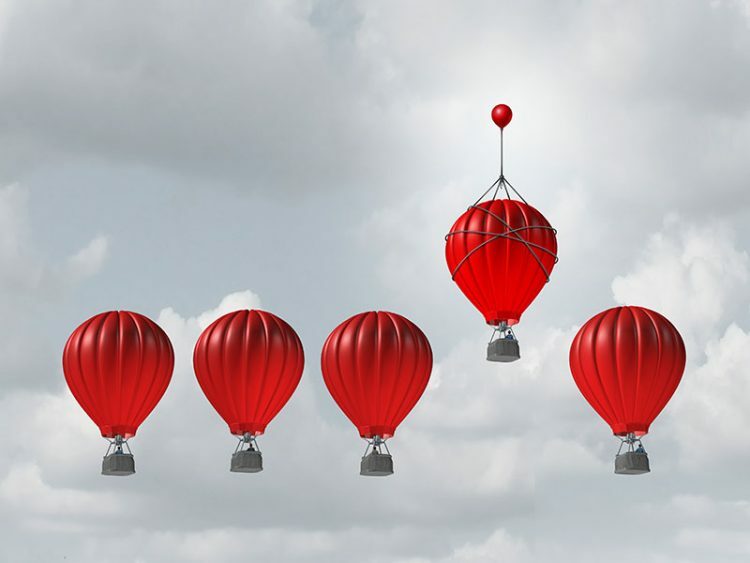 Change is coming for business owners. Are your clients ready? Change is coming for business owners. The federal government has revised the rules for how corporate passive investment income affects corporate tax. These revised rules will affect taxation years beginning after 2018, and may expose corporations to more corporate tax. Here’s what you should know. Active business income is generally the main and incidental income that a corporation earns from a business source carried on in Canada. Passive investment income generally consists of corporate earnings not directly related to those business sources. Passive investment income can come from certain interest types, capital gain, rent, royalties, or dividend amounts received by a corporation (and by its associated corporations). Corporations with large portfolios may earn significant passive investment income, as corporate portfolios typically contain assets such as fixed income investments and dividend-paying stocks. Right now, many Canadian-controlled private corporations (CCPCs) reduce the corporate tax rate on their active business income by using the Small Business Deduction (SBD). This entitles them to the small business tax rate, which is lower than the general corporate tax rate on business income. The amount of active business income eligible for the small business tax rate is limited to a CCPC’s business limit for the year. Since 2009, the federal business limit has been $500,000 (although limits for similar measures at the provincial level can vary). That means that a CCPC using the SBD can claim the small business tax rate on up to $500,000 of its active business income carried on in Canada, offering a significant reduction in tax. Things are about to change. New legislation passed in 2018 means passive income might now expose business owners to more tax on their active business income. Eligibility for the SBD also depends on the amount of taxable capital a CCPC and its associated corporations employ in Canada. If that amount exceeds $10 million, it reduces the federal business limit. If that amount reaches $15 million, the CCPC’s active business income is no longer eligible. That’s because new rules for passive investment income affect how much of a CCPC’s active business income is eligible for the small business tax rate. 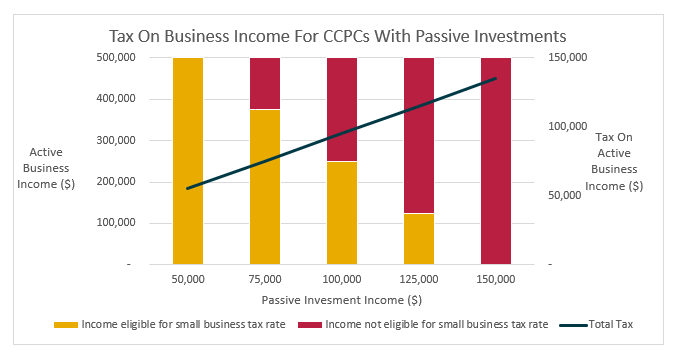 Once a CCPC’s passive investment income exceeds $50,000, the amount of active business income eligible for the small business tax rate is reduced.1 Above the $50,000 threshold, every $1 of passive investment income earned has the potential to expose $5 of active business income to additional taxation. If a CCPC earns more than $150,000 in passive investment income, its active business income is no longer eligible for the small business tax rate. For some business owners, this could have big consequences. Let’s assume that a CCPC in British Columbia2 earns $500,000 of active business income. The chart below demonstrates how the amount of passive investment income also earned by this CCPC now affects how much of that $500,000 qualifies for the SBD. If passive investment income is less than $50,000, all of that $500,000 will qualify for the SBD. This would result in $55,000 of tax on that active business income at the combined small business tax rate of 11%. However, as this CCPC’s passive investment income moves beyond the $50,000 passive income threshold, less and less of that $500,000 qualifies for the SBD. At $150,000 of passive income, none of the active business income will qualify for the small business tax rate. This has a dramatic effect on the amount of tax on that $500,000. For this CCPC, $150,000 of passive investment income results in $135,500 of tax on active business income at the combined corporate tax rate of 27%. That means that an increase in passive investment income of $100,000 – from $50,000 to $150,000 – would result in an additional $80,000 of tax on active business income. And that doesn’t even include the tax paid on the actual passive investment income itself. Click on Chart to enlarge it. Figure 1 – At $50,000 of passive investment income, all $500,000 of the example CCPC’s active business income is eligible for the small business tax rate. At $150,000 of passive investment income, none of that $500,000 is eligible. For some CCPCs, the combination of tax incurred on active business income due to passive investment income could ultimately lead to a tax obligation greater than actual passive investment income earned. For example, consider a scenario where a CCPC’s passive income of $150,000 is itself taxed at a combined federal-provincial rate of 50.7%. The resulting $76,050 in taxes, coupled with the $80,000 tax deferential mentioned in the above example, would mean that $156,050 in taxes result from that CCPC earning $150,000 in passive income. Also, because the new rules for passive investment income tie SBD eligibility to investment income earned by associated corporations, they typically can’t be avoided by using a holding company. Business owners have certain options for navigating these new rules for passive investment income. CCPCs typically have strong potential to generate savings because corporations can retain funds that give them greater cash flow. Also, as we’ve seen, up to $500,000 of their active business income may be eligible for the small business tax rate. Growth within an exempt life insurance policy will not affect a CCPC’s passive investment income earnings under the new passive income rules. It’s worth remembering at this point that life insurance can also play a key role in estate and succession planning. That makes this a great time for business owners to evaluate their corporate insurance portfolios to ensure they have the protection they need. At the same time, business owners can also consider how growth in exempt insurance policies might help benefit their business as these new rules take effect. The new passive income rules may warrant the review of the holdings and structures of clients who own incorporated businesses. As part of this process, business owners can also explore how tax-deferred investments can offer a tax-preferred means of earning passive investment income. It’s equally important to review existing policies to determine if shares of a CCPC will remain “onside,” so that shareholders will still be able to access their lifetime capital gains exemption on the disposition of qualified small business corporation shares. The incoming passive income rules can create new challenges for business owners, but proper planning can help. A client’s accountant or tax expert can help them with tax planning, and with how these new rules might affect their business. By consulting with clients, and with those that support their business, you can complement this process and help them understand their situation. 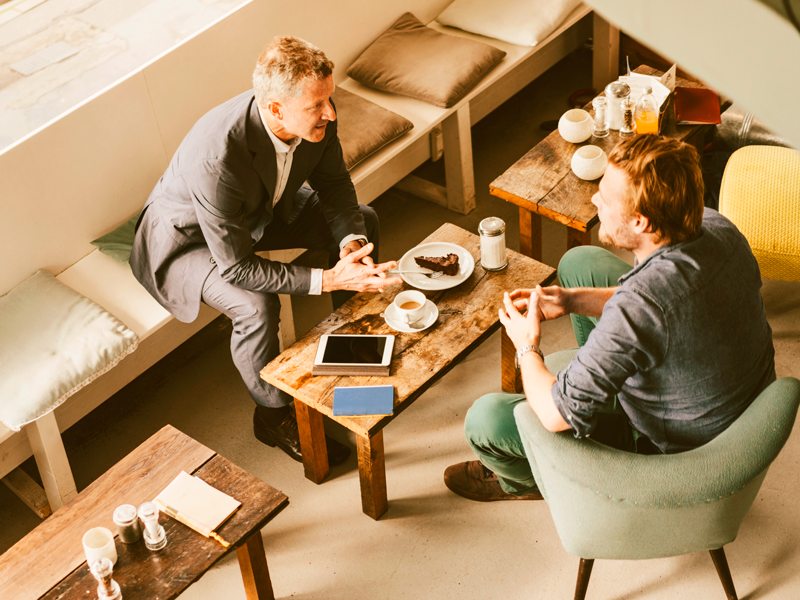 You can also help clients to choose the best options for their business, and to evaluate if corporately owned life insurance can play a beneficial role in their current and future operations. Disclaimers: Neither Sun Life Assurance Company of Canada nor the presenter has been engaged for the purposes of providing legal, accounting, taxation, or other professional advice. No one should act upon the examples/information presented here without a thorough examination of the legal/tax situation with their own professional advisors, after the facts of their specific case are considered. Unless specifically stated, the values and rates presented are not guaranteed. Mark L. Arruda, BMATH, FCIA, FSA, CERA, Assistant Vice-President, Strategic Business Development & Marketing Actuary, Insurance Distribution, Sun Life Financial. 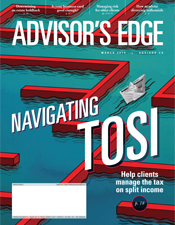 He’s found his niche helping explain often complex elements of product design to advisors in straightforward terms – so they can see opportunities more clearly and help clients reach their financial and retirement goals. 1 For simplicity, this article refers to passive investment income. Technically, the new rules apply based on the CCPCs “adjusted aggregate investment income,” which takes aggregate investment income and adjusts it for certain dividend and capital gain/loss transactions. 2 The new legislation affects the combined tax rates faced by CCPCs in each province. The rates for an Ontario CCPC’s active business income that is eligible for the small business tax rate are 3.5% provincially and 9% federally. The rates for an Ontario CCPC’s active business income not eligible for the Small Business Tax Rate are 11.5% provincially and 15% federally. Note that, in its 2018 Fall Economic Statement, the Ontario government proposed that it would not parallel the federal passive income measures. You’ve helped many clients plan their business succession – but have you thought about your own? Consider these planning tips for success. 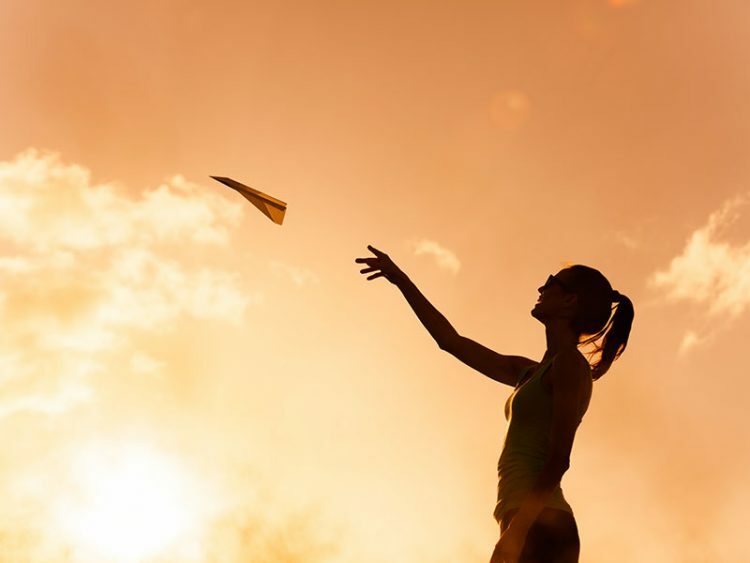 Understanding human capital as a person’s most valuable asset presents opportunities to deliver more value, think holistically, and improve peace of mind. There are many risks threatening retirement income plans. Four major categories of risk need to be accounted for and managed.